Some of my best childhood memories revolve around snow days, grilled cheese sandwiches and tomato soup. That’s when I lived down south, and any snow at all during the day meant early dismissal and a guaranteed day of playing outside in whatever amount of snow we could find. And with a stay-at-home-mom, I was also ensured a healthy dose of good ole American grilled cheese and my favorite can of soup. Nowadays, living up north and a far cry from snow-days, my grilled cheese sandwiches are ordered up in grown-up fashion, this time sans real Arla Dofino cheese (say yes to gouda grilled cheese! ), a healthy dose of ham, and some mushrooms. #GooeyGoodness knows no better. Which is why I like to live it up when making grilled cheese sandwiches, creating recipes like 3 Cheese and Tomato Grilled Cheese, Avocado and Bacon, and Loaded Pizza Grilled Cheese. All these taste SO amazing! Stacked tall. That’s how I take my Ham, Mushroom and Gouda Grilled Cheese Sandwich. 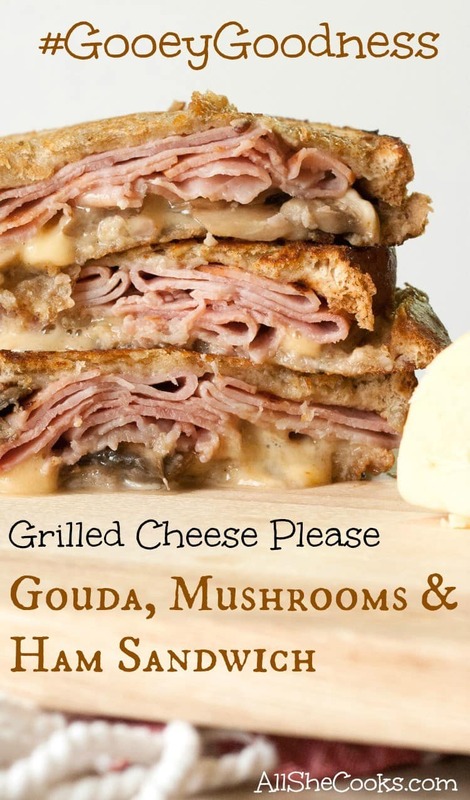 This gouda grilled cheese is all about the Arla Dofino Chipotle Gouda cheese. We’re talking a soft and tasty Gouda that I might have spent a good part of the NCAA Championship game chowing down on because I just couldn’t get my mind off it. 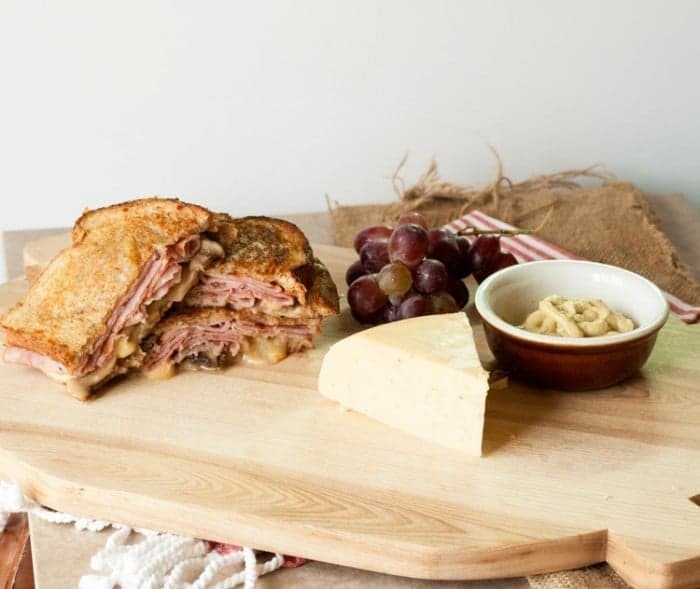 Arla Dofino brand of cheese includes a delicious range of family-friendly cheese types such as Havarti and Gouda — which means yes, you’ll have to share them with your family. But, you’ll want to share, share, share, because the cheeses are naturally good from farm to fridge. The cheese is free of added hormones, artificial flavors and preservatives, and crafted with quality, natural ingredients. Not to mention- they’ve been traditionally crafted in Wisconsin for more than 100 years. 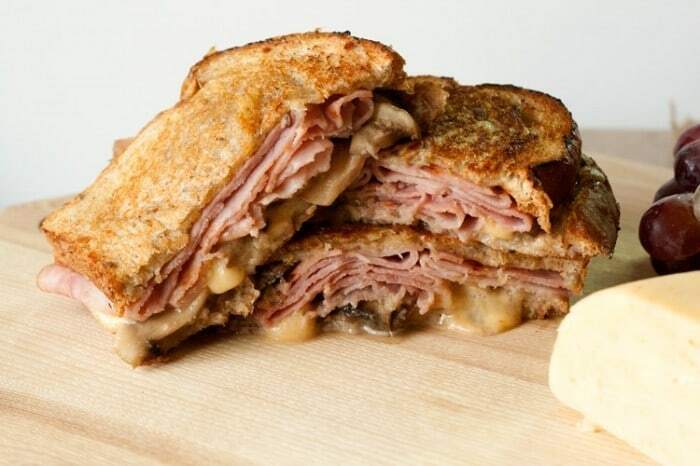 My Ham, Mushroom and Gouda Grilled Cheese Sandwich is perfect for National Grilled Cheese Day. You know, if you want to make a grilled cheese sandwich look menacing, cut it in half and stack it up. That will gain you the wow factor every single time. You know I like simple recipes. So, grilling up this grilled cheese is absolutely no exception. Easy Peasy. That’s how I roll. Heat up a grill and toss on a handful of fresh sliced mushrooms with a splash of olive oil. Stir them around just a little bit to coat with oil. Toss 4-6 slices of deli cut ham onto the grill–just to get it heated up good. Butter 4 slices of bread. 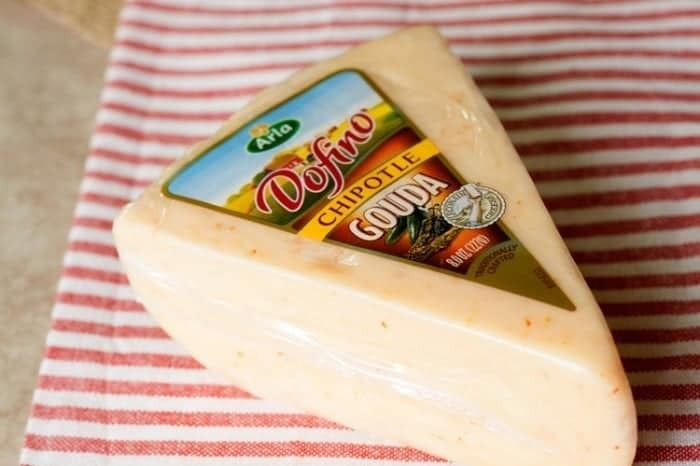 Slice up some Arla Dofino Gouda cheese to taste. I’m pretty cheesy…so the more cheese the better for me. Yeah, you see where I’m going with that one. Add a couple of buttered slices of bread to the griddle, and then top with the sautéed mushrooms, ham and the sliced cheese. Top with another slice of bread and then cook on both sides until golden. The result? Complete (gouda) grilled cheese perfection. My mouth is watering right now! I love any kind of cheese, and the addition of mushrooms and ham sounds delicious! Thanks for sharing with us at #2usestuesday! What a great combination. Your photos always make me hungry. Pinned and shared. Thanks for linking up at #ThursdayFavoriteThings! I hope you will join me Monday at #OverTheMoon! Oh yes, please, I’ll definitely have one of these lish looking grilled cheese sandwiches! Pinned it, and can’t wait to try it! Thanks! Awesome photos, the ham and grilled cheese is pretty good too. Sounds like a snack for tomorrow. you are right, cheese and mushroom are best combo., thanks for sharing with Hearth and soul blog hop pinning. Your recipe is so awesome it is featured this week in the Friday Favorites Linky Party! !